The model INT provides a 6 digit LED display counter that is proportional to the time integral of the signal across its input terminals. The input signal (voltage / millivolts / milliamps) may, in turn be a scaled analog of some other process variable. 1- Experience of handling pre-Signal Integrity and post-Signal Integrity Analysis. 2- Reflection Analysis for pre route and post route designs. 4- Timing Analysis for DDRx interfaces. 5- Calculating Setup and Hold time Requirements and capacitive loading effects. Sen Tec Electronic Design provides high-performance PCB Layout services utilizing high-end software programs complemented by leading edge hardware. Our capabilities encompass the full electronic design flow from start to finish including Schematic Capture, Cad Library development, data base construction and verification, Signal Integrity Analysis. - Successfully executed complex Multidrop/Multipoint topologies. - Asserting PCB layer stackup/Layer ordering/PCB materials based on SI results. We carry out signal integrity analysis on existing PCB products in order to locate and fix SI problems. We also analyse new products during the PCB layout phase to validate designs and avoid SI headaches arising in the first place. Shrinking timing and noise margins are the leading contributors to signal integrity and power integrity issues in electronic products. Signal Integrity Studio is a stand-alone software package that performs eye diagramming and jitter analysis on simulated or saved signals using the S-parameters of a user's DUT. "SI Studio" is an extension of the Teledyne LeCroy SPARQ software application, and provides Teledyne LeCroy's powerful and easy-to-use Eye Doctor II and SDA II capabilities at a very affordable price. SmartPlay’s Analog Mixed Signal Design capabilities are in the areas of Mixed Signal Circuit Design, Characterization, Independent Signal Integrity Analysis, Mixed Signal / Analog Layout and Validation of Layout with post layout simulations. Pre-layout analysis: To determine good stack-up and the effectiveness of critical component placement, critical signal paths and routing parameters. 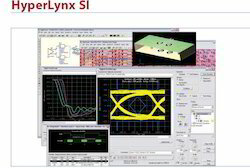 Signal integrity (SI) analysis allows visibility of how signals are going to behave as they traverse PCB traces, vias, connectors, passive components, etc.